I've heard of Bread and Butter Bistro in Holtsville on the radio over and over so I typed it into Google. I was surprised to see a Groupon deal but checked it out anyway. 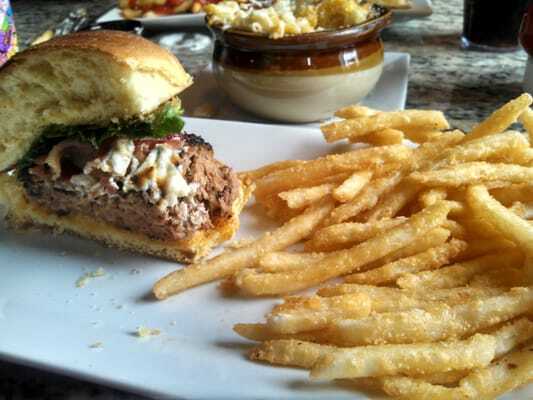 $25 for $50 worth of food, sounds good to us! That means more to try and more to report back on. But anything on Groupon is always a red flag.. it typically means a place is struggling to get people in the door and it needs to do something drastic to change that all around. When we first arrived, we knew it would be attached to the Ramada Inn but upon first glance, it looked kinda strange. I've never seen a setup like that before. We walked into a lobby that really smelled like a public restroom but once we entered the restaurant, it was entirely different. It looks like the owners put a lot of money into the place with granite tables, leather (or pleather) seats, engineered hardwoods, flat screens, lighting and even the fabric used on the booths. Can't forget the metallic tin ceiling. It has a mix of an art deco/sports bar vibe and overall the whole place looks great. First impression was rather good and the hostess/only waitress was also very nice from the very beginning. Since we had extra money to spend, we got two appetizers, two entrees and even two desserts which is way more food than we can handle. We wanted to try the wings but at over a buck a piece, we just weren't going there. I don't care how good they are, its not happening. We went for the Dragon Chicken Tempura at $9 and "Homemade" Mozzarella Sticks for $8. I say homemade in quotes because I'm sorry but to look like that, there's no way they're homemade. Perhaps homemade and then frozen, but I'm pretty convinced they are as frozen as they come. They weren't anything special in fact they were bland and DESPERATELY needed the sauce. I don't use sauce on mozzarella sticks EVER, and yet I was drowning them. 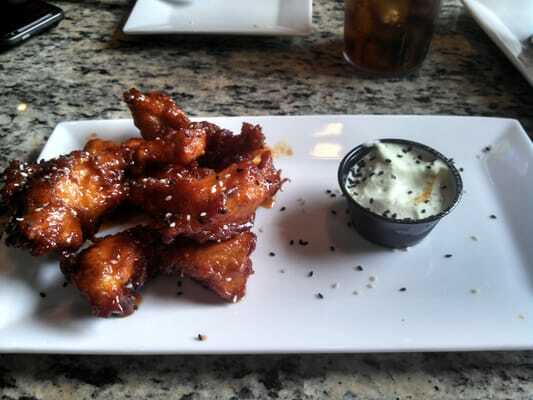 On a completely different note, the Dragon Chicken Tempura was tossed with a sweet chili sauce with a side of Wasabi Mayo and sprinkled with sesame seeds (see pic). They were AWESOME. Not too spicy at all, good balance and good crunch. Probably one of the best things I've had in awhile. For entree's we ordered the Buffalo Chicken Sandwich and the B&B Burger. It is definitely a frozen processed chicken patty. The bun was huge and I felt like I was eating a bread sandwich. 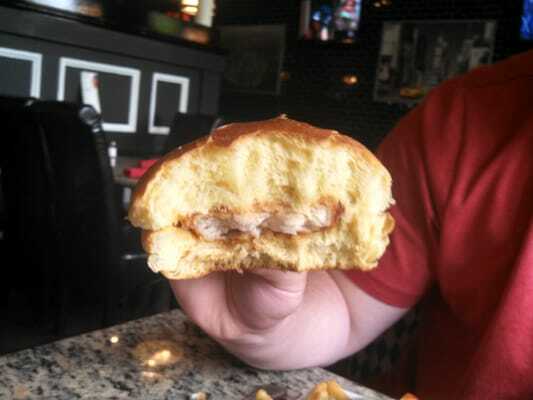 It seemed under sauced because of the size of the bun (see pic above). I didn't finish it. It wasn't worth getting stuffed over. As for the burger, my wife ordered it medium and it was well done. The consistency of the meat was strange for a burger and it reminded her of meatloaf. It was loaded with bacon and tasted good, but it would've been GREAT if it was cooked right. She asked for no tomato, and even though there was none when it came out, there was tomato seeds and juice on the lettuce. Good thing she's not allergic! As for the fries, they are delicious, crispy, salty and just everything you'd want in a fry. For our toddler, we ordered the appetizer Crock Pot Mac 'n Cheese and it was good. Something to try if you're a Mac 'n Cheese fan. For dessert we ordered the Chocolate Fudge Brownie with Vanilla Bean Ice Cream, and even though we were pretty full, we downed it in only a few minutes. The brownie was warm and gooey (probably microwaved) but delicious and my wife immediately said she thought the ice cream was homemade. Drop the price by a dollar and it'll be even better. We also got carrot cake to go, and didn't actually try it yet. I'll report back once we do. I opened it when we got home to take a look and for $6, its a wimpy looking slice of carrot cake. While we were eating, we mentioned to each other how the food seemed familiar. The mozzarella sticks, a thin chicken patty, the huge bun. Even the fact that our hostess was also our waitress. It was like deja vu. I got up to check out some other areas of the restaurant and saw a flyer and promo card that talked about events there at B&B, at Canz-a-Citi Roadhouse (click for review) and at Emporium in Patchogue. The light bulb came on. How did I forget that Bread and Butter Bistro is owned by the same people as Canz? If I remembered that, I wouldn't have bothered getting the Buffalo Chicken Sandwich. You might think I am getting hung up on this sandwich but let me explain something. This is the kind of sandwich you get at a school cafeteria. It's what you serve to guests at your house that you never want to walk through your door again. It's like an insult to get served pre-frozen processed crap! Do the owners not like people? Do they want people to come back? Because anyone that orders that sandwich is highly unlikely to return. Just a little piece of advice is change the damn sandwich. In both restaurants! So here's our take. We are split 50/50 on the food. No issues in the service department and the decor and vibe of the place is awesome. I should mention that since it's attached to the hotel, the restrooms are actually INSIDE the hotel so get ready to walk a bit. Overall, o-k. The vibe and decor makes up where some of the food lacks but what really matters should be the food. We like total dumps that have amazing food so I don't think we'll be back just for the decor. Try the Brownie and Dragon Chicken Tempura. My best advice is to order a few appetizers between people, that way you don't spend a ton and you won't leave disappointed.